Utterly enchanting, this outdoor evening reception in a garden setting sets the stage for elegance and romance in this photo by Amanda Marie Photography of Arizona. What really makes this reception setting magical is the gorgeous lighting on the tree, created by simply using an abundance of clear twinkle lights (mini-Christmas lights), and the strings of hanging lights suspended from above which cast a soft, romantic glow over the entire reception area. The tall floral centerpieces that tower above the tables in clear acrylic trumpet vases look absolutely amazing – the calming hues of mauve and white are complimented by the twinkle lights in the background. 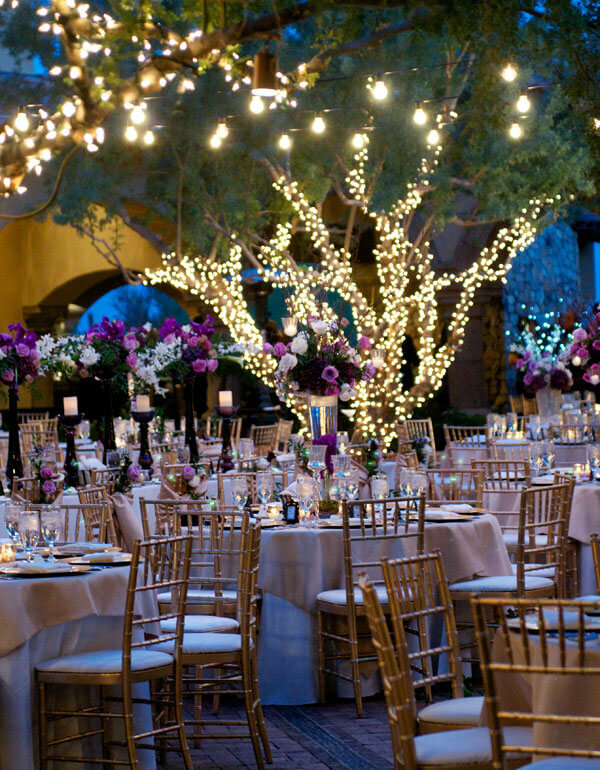 Below, another enchanted evening reception comes to life with magical lighting in a similar outdoor garden setting. Again, here it’s the lighting suspended from above that really helps to create the magical mood for this setting. 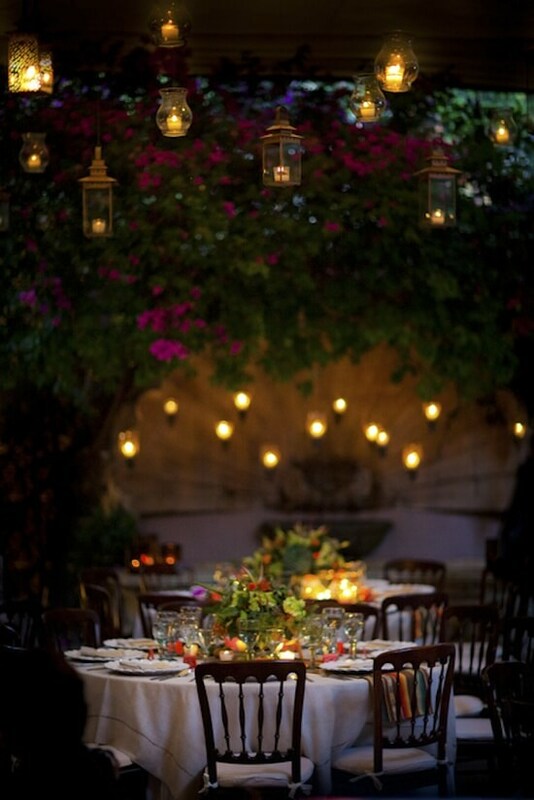 The hanging candle lanterns look fantastic against the back drop of floral vines on the wall in the background. The tables themselves look stunning, but they are actually set quite simply. In a beautiful outdoor setting, simplicity is all you need when it comes to table design and reception decor – you don’t want to compete with the natural beauty of the environment. White china is laid out upon white linen table covers. Full size floral centerpieces are in perfect harmony with the outdoor garden environment. Votive candles on the tables harmonize with the same warm glow provided by the candles suspended from above. A colorful striped table runner which cleverly picks up the colors from the flowers in the centerpiece is laid out across the table, and drapes over the sides of the table at each end. Three Stunning Holiday Season Wedding Color Schemes Design a Vintage Sweetheart Table & Backdrop. Go Shabby-Chic! I’m sending my wedding decorator to SuperWeddings to see this and replicate it for me. Thank you so much. This was exactly the kind of thing I was looking for but coud not find anywhere. I love this site.